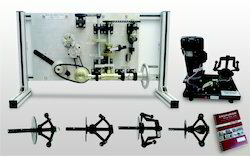 Basic Mechanism Systems Trainer have been designed to provide the industrial Mechanic Apprentice with all the tools to develop the understanding which is necessary to assemble, repair, overhaul mechanical systems used in modern machinery, This trainer allows for measurements, proper removal and installation of belts and chains as well as examining mechanical components. ur independent table top standing, operatable, hard assemblable setups are used for practice. Supplied along with manuals. 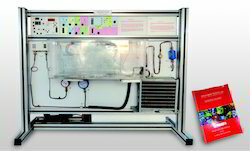 Aluminum profile sturdy flat panel (table top) system, carrying various high voltage components housed in plastic enclosures (panel) to minimise shock possibility. Two Systems can be handled in a siingle setup namely Refrigeration and Air Conditioning. Light weight, yet sturdy tabletop, Aluminum profile (30x30) modular flat demo panel setup with SS (304/316) piping and wide angle view of every component in process. No hidden parts. Optionally PC interface with graph plotting facility provided. Thyristorised DC drive is used to set RPM for prime mover coupled to each pump. 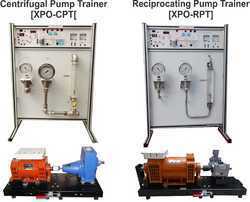 Trunnion mounted prime mover with speed torque sensors giving accurate shaft power pump output delivery measured in terms of flow in LPH pressure in bar to determine efficiency of pump. Each panel has ABS molded plastic sturdy enclosure, and colorful screwless overlays showing circuits diagrams its connection tag numbers for easy understanding and connection, 4 mm shrouded banana patch cords for shock proof connection. Set of Instructor Guide Student Workbook. • Facilitates easy and safe wiri ng by students due to use of 4mm sturdy Shrouded banana patch cords and shrouded socket arrangements for high voltage circuits.